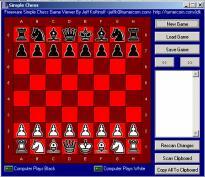 A simple chess program. The main reason I wrote this was so I could easily play chess against friends via e-mail. It uses algebraic notation to list the game moves and has single button clipboard control so it is very easy to email games back and forth without using attachments. Just press 'Copy all to Clipboard', and paste all the game moves into your email. 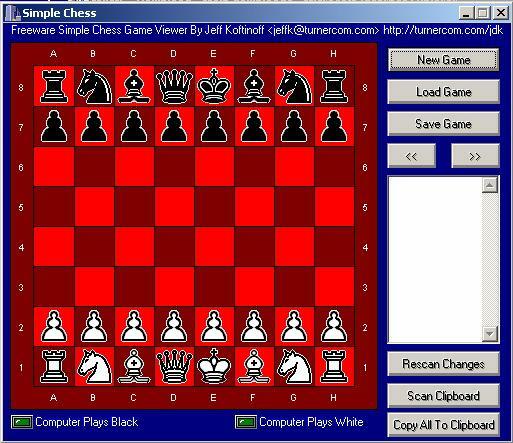 The other person selects the game moves and presses 'Copy' on his e-mail program, then presses 'Scan Clipboard' on SimpleChess. Free software. Written in Borland Delphi. Source code not available.